A delegation of players and officials of Asante Kotoko left Ghana on Monday morning for Congo ahead of their preliminary round second leg clash against CARA of Congo on Wednesday, 21 February 2018 in Brazzaville. The Porcupine Warriors go into the return leg with a lone goal victory from the first leg played in Kumasi two weeks ago. In a game that saw Kotoko miss three penalties, before converting the fourth, Head Coach Steven Pollack has downplayed the effect of the first leg trauma coming back to haunt them for the return. “What happened in Kumasi must not repeat itself so we have corrected our mistakes in all aspects especially the art of taking and scoring penalties. “It was a good thing we won the first leg. Now we know who are opponents are and what they can do; that makes it easier to plan, unlike the first leg. We are not taking chances. We are going all out on Wednesday to make sure that we gain qualification to the next stage of the competition,” Pollack told the media. 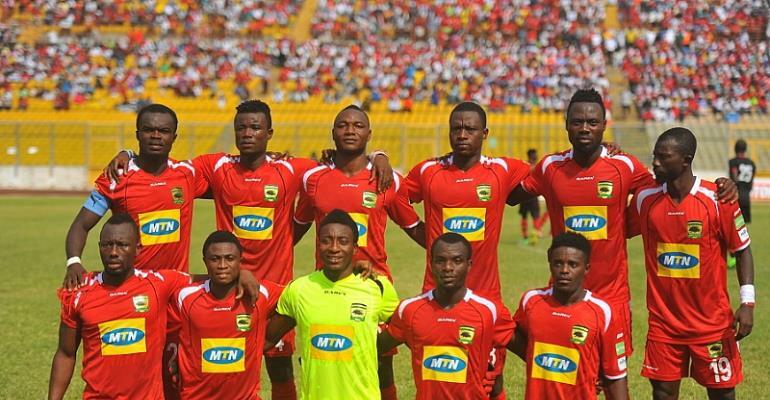 Kotoko last won a continental competition in 1983 and after two failed attempts in continental football in the last two seasons, the Porcupine Warriors hope they can ride on the win in the first leg to dump CARA, a familiar foe in the Ghanaian side’s history. The nine-time Congolese champions, who are aiming to reassert themselves in Africa after being kicked out of the competition at the first round and preliminary stages in 2014 and 2015 respectively, were eliminated by Kotoko in 1976 when they clashed in the Round of 16 of the African Club of Champions Clubs (now CAF Champions League) with the Ghanaians qualifying on the away goal’s rule after a 2-2 aggregate score. In 1983, Kotoko beat the Congolese side 4-3 on aggregate en route to their second African Cup glory. And 35 years on, the two sides clash again with Kotoko hoping to maintain their dominance over the 1974 African champions. With the notable exception of injured Abass Mohammed, Polack has a clean bill of health as he plots to execute the important assignment. He has a mix of young and experienced players such as captain Amos Frimpong, goalkeeper Felix Annan, Seth Opare with Kwame Boahene, Emmanuel Gyamfi, strikers Saddick Adams and Yakubu Mohammed, and evergreen midfielder Jordan Opoku to choose from. With the promise of a two-bedroom house for each player, if they win second-tier continental club championship ringing in their minds, as well as a cool GH¢20,000 ($4,480) financial reward for reaching the group phase, they will have themselves to blame should CARA eliminate them at this stage. “We are ready for the second leg and I plead with all Ghanaians irrespective of Club affiliation to throw their weight behind us because we are representing Ghana as a country. “We have learnt a lot from the first leg and we are ready to face them boot for boot in Congo. We are going for a win on Wednesday,” defender Eric Donkor said.